I am so thrilled to have so many wonderful dog products to share with you this week. 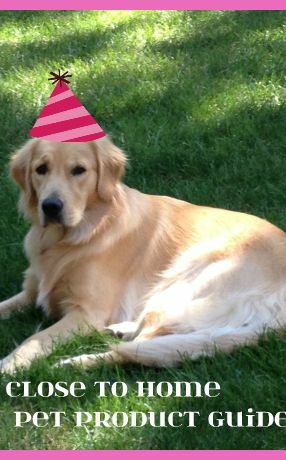 Our puppy turned one and this prompted us to create a Pet Product Gift Guide. This series will also include some recipes to have a successful pet birthday too. The first product I wanted to share with you is the Italian Leather Collar and Leash by DogID’s. Before I get into the beauty of the collars for my princess, I want to share how wonderful it is not to have those clinking of the tags whenever she moves. Having the ID on the collar is such a great idea. No worries about them falling off. Once on a road trip my husband put the leash on the tag ring instead of the collar ring and they all fell off. Talk about scary, we were at a gas station off the highway when she broke free! Now back to the new princess in the neighborhood. My son especially loves to strut his pup around in her new hot pink collar and leash. I don’t think I have a purse this nice!! What a wonderful real leather smell! While not practical for the dog who is going to be out in the rain or swimming all day, this is defintely wonderful for the showcased animal in your family!! Here is just a small example of the colors available for these collars. Don’t forget the matching leashes that also can be ID’d. She looks so regal in her new collar. Just love the look of these collar and leash combos I had to take several pictures from different angles. Since Chloe was not quite one yet and not sure how much she is going to grow I ordered a size I thought she would grow into. It is obvioulsy too big for her and I do hope she get a little bigger. DogID’s has a video on just how to size your dog for the particular collars. This is so helpful I just wish I listened to what they suggested. (You can see the excess overhang on the collar) But the leather should outlast any of the ribbon or webbed collars we own so look forward to many years with this. 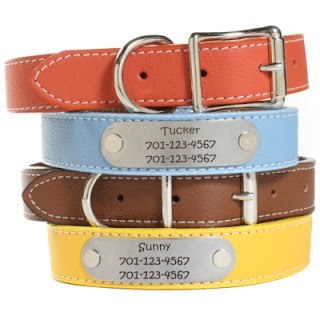 If you dont mind the dangling ID’s on your dog’s collars, check DogID’s for unique and fun collar charms and Dog Tags for your pup. Follow them on Twitter and Facebook too for upcoming sales and promotions. They currently have a PhotoContest going on their Facebook page to win a free personalized collar and leash that ends on Saturday. I was given this product for review purposes and not given any additional compensation. All the opinions are my own. ill have to show this to my sister. I dont have a dog right now but she does!!! I love this! Our golden pup is just 9 weeks old. And yep, with our other dog we went crazy listening to the clink clang! We recently got a puppy, I never knew how hard it is to find a good collar. thanks for sharing this! If I had a dog, I’d buy one of these! They look so well made and durable. Maybe now I’ll finally let The Texan get the dog he’s wanted! Those leashes are so cute!! I am going to tell my sister about it! My aunt lost her dog just a couple of months ago and it helped a lot that the dog had a collar with ID. If we ever get a dog, we’ll definitely purchase this! Love the leash, looks like it is great quality and Love the color! good review!! I think these look like great quality products, I’ll recommend them to my best friend. She has three dogs and would appreciate something like this! Very interesting idea and classically implemented! Bravo! I don’t have a dog, but I really like this idea. Great way to keep from losing those important tags. I love the name Chloe! The pink color looks so great on her. My little Princess Carmella would love it too!